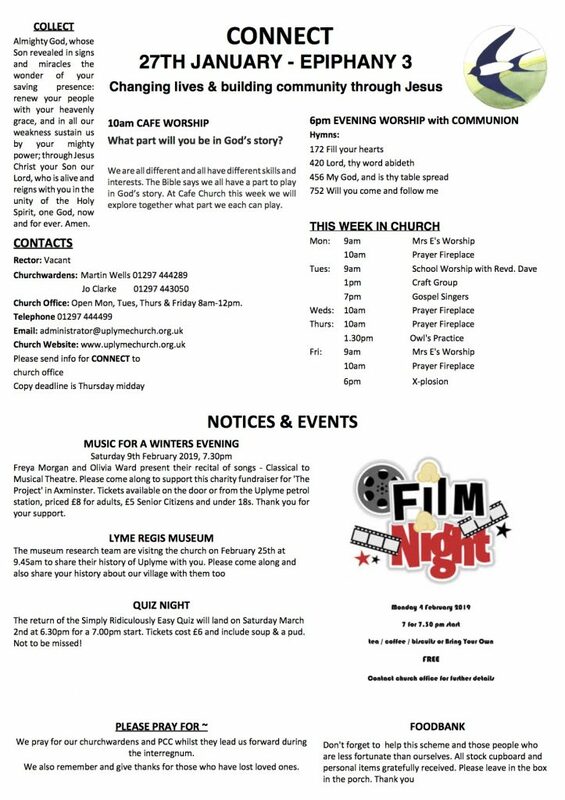 The latest Parish News can be downloaded as a PDF from uplyme.com. Come and join us for worship on this very special day. Everyone welcome! Worship at Uplyme Church Regular communal worship provides an opportunity for us to meet with God, worship together and find fellowship. We aim to provide regular communal worship in a variety of styles which are relevant to those around us. Our worship involves, and is often lead, by a team of church members. 10am Morning Worship Is relatively informal, contemporary and inclusive. We use uncomplicated, modern liturgy and a wide range of hymns and songs. Children are always welcome and we run Junior Church, in the most weeks of term time, in the upstairs area of church. Communion is usually on the first and third Sundays of the month. Café Worship Takes place at 10.00am on the last Sunday of the month. It is a simple, informal worship service, with dvds or films, activities for all ages, discussion groups, songs and prayers. As the name suggests, refreshments are served beforehand and throughout. 6pm Evening Worship Is quiet, contemplative and seasonal. We draw on the rich tapestry of Christian liturgy and worship. Communion or an Agape Meal is usually on the second and fourth Sundays of the month.